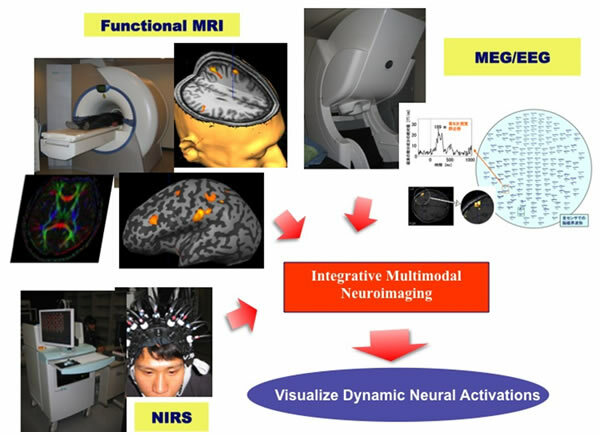 The mission of our lab is to advance the state of art of functional biomedical imaging and neuroengineering through innovation in engineering methodologies which will contribute to basic sciences and biomedical applications. We are engaged in research to explore the remarkable brain and biological functions and to apply their fundamental principles to the leading edge of electrical and electronic engineering. We are particularly focusing on the human higher brain functions including visual functions, memory, perception, and consciousness as key research topics based mainly on the non-invasive measurement techniques, such as functional magnetic resonance imaging (fMRI), magnetoencephalography (MEG), and high-density electroencephalography (HD-EEG), and on the measurements of behavioral psychophysical data and eye movements combined with computational and theoretical approaches. In addition, we are developing novel and integrated neuroimaging techniques including spatial filtering (beamforming) techniques. Due to the increasing importance of multimodal approaches to the study of the human higher brain functions, we hosted the 18th Meeting of the International Society for Brain Electromagnetic Topography (ISBET 2009) that was held at Kyoto International Community House, Kyoto, from September 29th to October 2nd, 2009. We are collaborating with investigators from the Graduate School of Medicine at the Kyoto University on research into neuroimaging and brain-machine-interfaces for people afflicted by sensory functions such as visual and auditory systems and motor function disabilities caused by illness or accident, with the aim of making a contribution to engineering for medical care and welfare. A particular strength of the laboratory is its combined mission of developing advanced engineering technologies for biomedical applications and investigating the higher brain functions using the techniques developed in our laboratory. Furthermore, as a member of the "Cutting-edge Techno Hub for High-order Bio-imaging" (a joint venture between Kyoto University and Canon, Inc.), we are tackling development of ultrasensitive optical pumping atomic magnetometers, for the purpose of promoting medical care innovations to promote faster diagnosis of illnesses and more effective preventive treatment. Copyright(C) Kobayashi Laboratory All rights reserved.